Grade 3-5 In this picture book for older children, a Japanese potter learns about nature and life. Yukiyo finds that life and the seasons bring both good and bad as he and two willow trees that he has tended from saplings struggle with the forces of naturethrough winds, drought, and flood. One tree remains standing, the other becomes a bridge. At the end, Yukiyo and his family prosper. This is much more of a mood piece than a story. The witty dialogue of Pittman's A Grain of Rice (Hastings, 1986) is replaced, sadly, with uneven, sometimes plodding narration. For example, most of the introductory paragraphs begin similarly with ``the days passed'' or ``as the months went by.'' The storyline itself is made up of odds and ends that aren't totally developed. Most of the watercolors are beautifully executed with flowing scenes, although some pictures are cut into panels for no apparent reason and to little effect. Marianne Pilla, formerly at Allard K. Lowenstein Lib . of Long Beach, N.Y.
Yukiyo is a contented potter who lives near the Okayama river, where the soft red earth embedded in its banks is his clay. He worries that the two willow saplings by the river will not survive, but each year they grow stronger. In the meantime, he has found a wife, Kura, and their life together is rich and full. When first drought and then flooding strike, the potter, his wife and their newborn child must leave their home, a feat that is only possible because one of the willows has fallen over the river like a bridge. 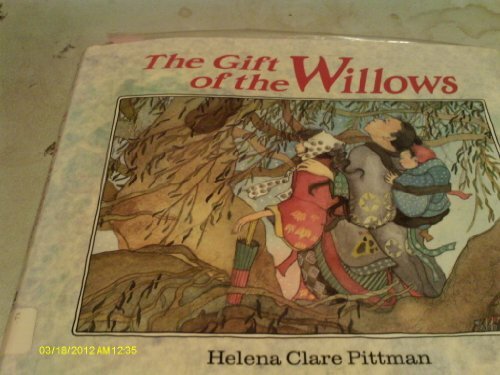 Pittman's story is poetically revealed to readers in quiet, controlled passages next to glowing watercolor spreads; gilded, silky fabric patterns in the family's clothing establish the Japanese setting. In pictures and words, the book invokes timeless folkloric themes with grace. Ages 5-9.